Urethane belt skirting for industrial distribution and production facilities is manufactured at Plan Tech for over 30 years. We produce urethane belt skirting to ensure that engineers and production supervisors can enjoy maximum efficiency and the satisfaction of reduced downtime and increased efficiency. We apply speed and precision while manufacturing our belt skirting just as is the case with all our urethane products to ensure that we consistently meet the qualitative and quantitative demands of our customers within the shortest turnaround possible. 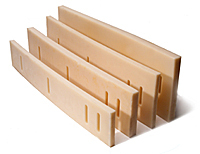 Our rubber belt skirting is popular in the industry for their outstanding physical properties. When it comes to resisting wear, abrasion, and chemicals, etc. the belt skirting that is manufactured by our world-class team of engineers are second to none. With our rubber belt skirting, you can be certain you’re settling for specialty products that offer great value for your money. Our belt skirtings offer 100% efficiency and are capable of maintaining their optimal performance even after long years of service. So, tell us! For what application or applications do you seek polyurethane belt skirting for? Do you have a particular design or sample in mind? Or are you just looking for a reliable company you can entrust with your industrial belt skirting project? Are you interested in cast Urethane Belt Skirting? Please Contact us so we can help solve your requirements and work with you on your specific application!